!BIRTH: about 1796; Estimated birth year from death record below. He resided in Creagh, Agahavea Parish, County Fermanagh, Ireland in 1834 but his birthplace is unknown. James Banford/Bamford was probably not the son of Samuel Bamford of Derryheely. The Brooke Estate Deed for Samuel Bamford describes his oldest son as John Bamford aged 10 in 1807. It is of course possible that John Bamford was older than 10 but the deed also describes William Bamford age eight as the second son so James would have to have been born after 1809 to be the son of Samuel Bamford of Derryheely unless both John and William were actually older than ten and eight in 1809. !BIOGRAPHY: To Essie Bamford O'Neill from Della Cooke Crawford Dated 1-8-1962 Your great grandfather’s name was James. He had a large family. His wife’s name was Margaret Emerson. His daughter's name was Jane who married Galbraith Moffatt. Mary who became Mrs. James Crawford lived on the homestead in Crieve, raised her family there and I think there was a Margaret who was drowned coming out here. Her son’s names were William, James, Robert, and Edward. William, Robert and Edward married three sisters named Murphy (Not RC`s). Your great grandmother lived with your great aunt Mary Crawford and died with her at the old home stead in Crieve, your great grand father also and were all buried in Colebrook churchyard. !RESIDENCE: 1864; Per Griffiths Valuation his residence was Crievehill, Enniskillen, Fermanagh, Ireland. He also leased land in two other townlands: Cavanaleck and Tattynuckle in 1864. His landlord in Creevehill was the Earl of Ranfurley. Griffith's Valuation for 1864 includes a valuation of tenements in the Parishes of Enniskillen and Aghalurcher broken down by Townland and including a reference number to the accompanying valuation maps. See www.AskAboutIreland.ie/griffith-valuation for original documents and maps. Ref. 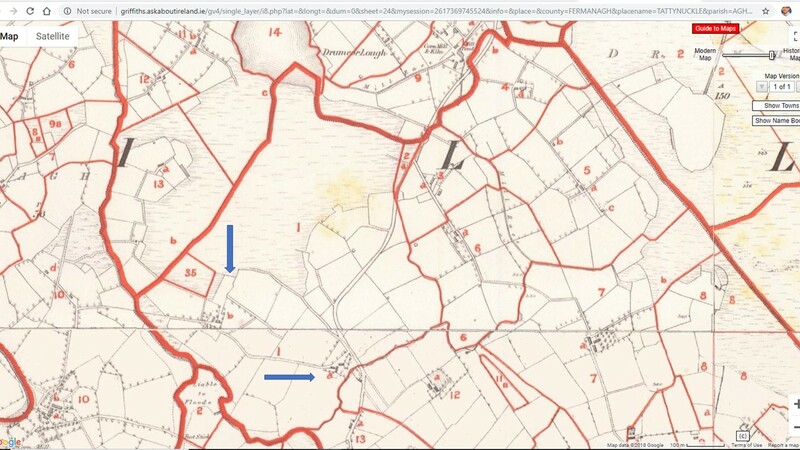 # 1a, Townland: Creevehill; Parish: Enniskillen; Occupier: James Banford; Immediate Lessor: Earl of Ranfurly ; Description of Tenement: House, Offices and Land; Area: 110 Acres, 0 Roods, 20 Perches; Rateable Annual Valuation- Land: 34 Lbs. 5 Shillings, Buildings: 1 Lb. and 15 Shillings ; Total Annual Valuation of Rateable Property: 36 Lbs. This parcel is by far the largest in the townland. Ref. # 1b, Townland: Creevehill is a sub lease; Occupier: Margaret Orr; Immediate Lessor: James Banford; Description of Tenement: House; Area: blank; Rateable Annual Valuation- Land: blank, Buildings: 5 Shillings; Total Annual Valuation of Rateable Property: 5 Shillings. Also carved out of parcel #1 is a two acre parcel #35 which is subleased by James Banford to James Simonton which includes a house and land. 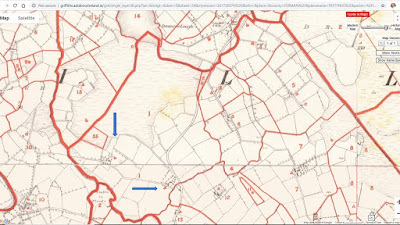 The valuation map of Creevehill Townland shows parcel #1 in the northern portion of the townland just south of Drumcor Lough which is in the vicinity of the town of Clabby. I have created an image based on the maps available at AskAboutIreland.ie/griffith-valuation which shows arrows pointing to house #a and house #b.
Ref. # 13a, Townland: Cavanaleck; Parish: Aghalurcher; Occupier: James Banford; Immediate Lessor: Sir Victor A. Brooke, Bt. ; Description of Tenement: House, Offices and Land; Area: 35 Acres and 1 Rood; Rateable Annual Valuation- Land: 27 Lbs. 15 Shillings, Buildings: 5 Lbs. ; Total Annual Valuation of Rateable Property: 32 Lbs. 15 Shillings. James Banford was subleasing a house to John Gawley on this parcel shown as 13b. Ref. # 5, Townland: Tattynuckle; Parish: Aghalurcher; Occupier: James Banford; Immediate Lessor: Sir Victor A. Brooke, Bt. ; Description of Tenement: Land; Area: 15 Acres 0 Roods 5 Perches; Rateable Annual Valuation- Land: 9 Lbs., Buildings: --; Total Annual Valuation of Rateable Property: 9 Lbs. I have attached the 2006 Philips Street Atlas of County Tyrone and Fermanagh p. 90. 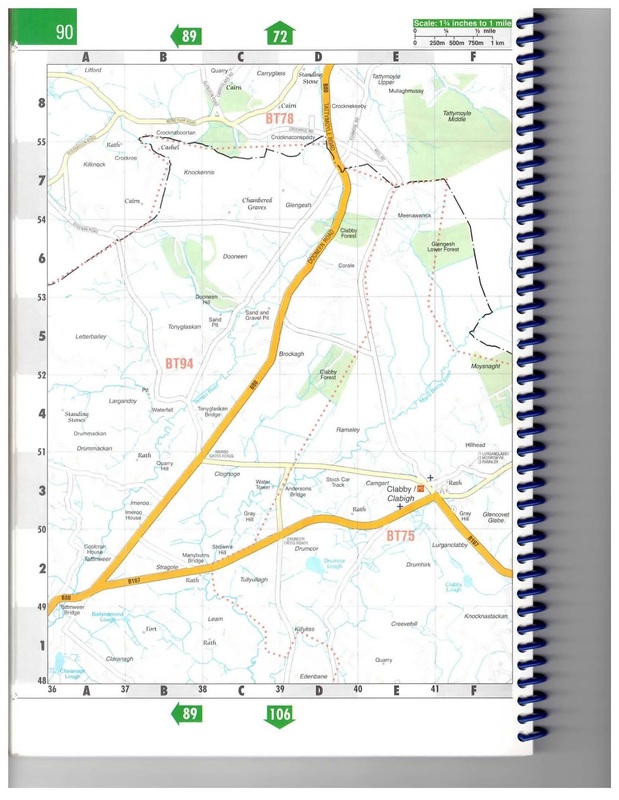 Creevehill township extends through sections D and E and numbers 1 and 2 in the southeast corner of the map. The James Banford parcel was south of Drumcor Lough which is in D2. 2006 Philips Street Atlas of County Tyrone and Fermanagh p. 90.